Users who like Dr. Seth Lederman is Co-Founder & CEO of Tonix Pharmaceuticals (TonixPharma.com); the clinical-stage biopharmaceutical company just announced the first participant is enrolled in the RECOVERY study, a new Phase 3 study of Tonmya, their treatment for PTSD. Users who reposted Dr. Seth Lederman is Co-Founder & CEO of Tonix Pharmaceuticals (TonixPharma.com); the clinical-stage biopharmaceutical company just announced the first participant is enrolled in the RECOVERY study, a new Phase 3 study of Tonmya, their treatment for PTSD. Playlists containing Dr. Seth Lederman is Co-Founder & CEO of Tonix Pharmaceuticals (TonixPharma.com); the clinical-stage biopharmaceutical company just announced the first participant is enrolled in the RECOVERY study, a new Phase 3 study of Tonmya, their treatment for PTSD. 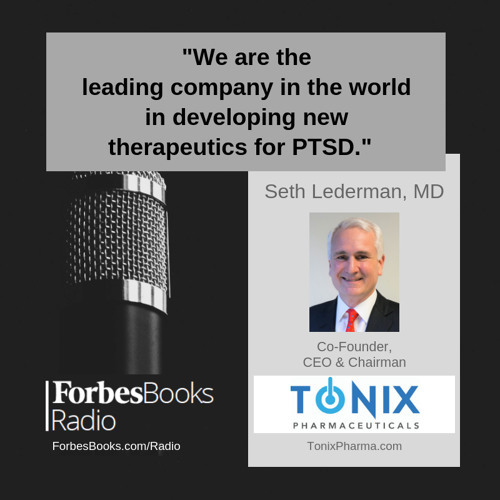 More tracks like Dr. Seth Lederman is Co-Founder & CEO of Tonix Pharmaceuticals (TonixPharma.com); the clinical-stage biopharmaceutical company just announced the first participant is enrolled in the RECOVERY study, a new Phase 3 study of Tonmya, their treatment for PTSD.